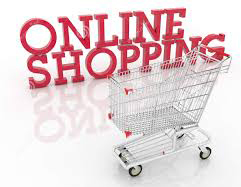 When you’re looking to buy your next set of Mercruiser Exhaust Manifolds or Risers note that Performance Product Technologies (PPT) has been one of the leading online suppliers of Marine Exhaust Manifolds and Risers since 2002. PPT’s roots trace back to starting a career in the engineering department with Mercruiser in the early 1990′s. During our time of employment with Mercury Marine our primary focus was within the Marine Exhaust and Marine Cooling System engineering project groups. The following historical timeline was put together outlining a few products the owners of PPT were directly involved with at bringing to production. This product experience allows us to provide our customers with a higher level of technical customer service expertise when selecting the best Marine Exhaust product options for their particular applications. Between 1990 and 1995 our focus was with the development and phasing out of the original Stainless Steel riser that Mercruiser used on the Big V8 marine engines and Bravo model small V8′s. Being that this exhaust riser was produced in stainless steel it was cast using a casting method known as the Hitchner process. This proved to be a costly approach to producing the riser which in combination to the functional issues made it an easy decision to discontinue production on it. There are still quite a few of these risers left in service so its not uncommon to run across them. However since they were notorious for NOT maintaining adequate clamp load which allowed for water to get into the engine we recommend updating to the current style of 4″ exhaust riser. Due to the elimination of the Stainless Steel Exhaust Riser management at Mercruiser needed to find a suitable Premium Exhaust product to be offered as a replacement to the Stainless Riser. The stainless riser had been marketed as a premium product on the big V8 marine engines as well as the Bravo model Small V8 product offerings. Therefore in 1997 a team was put together to evaluate potential coating options. As part of this team we established a variety of field tests on both the East and West coasts. A range of products was tested in corrosive environments that included both exhaust and cooling system products. These specific tests were established to evaluate different coatings and how they survived when exposed to a variety of running conditions that ranged from 1 hour to 750 hours of engine running time in a single calendar years time. This testing eventually proved that coatings were a viable and cost effective option at combating the long standing corrosion problem the marine exhaust systems deal with. Based on this testing PPT later developed and still offers their exclusive line of internally & externally coated marine exhaust manifolds and risers. (Read More). Also taking place during the mid 1990′s we worked on this project that involved replacing the original 1 piece 3.0LX exhaust manifold that was used on the 140 Hp version engines up until 1995. This project was initiated by General Motors when they discontinued the lower Hp 3.0L marine engine after deciding to go strictly with the 140 Hp 3.0LX across the board. 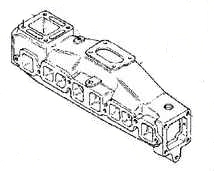 This project involved modifying the original lower Hp exhaust manifold with end caps such that it could continue being used on the large port 3.0L cylinder head as required for service applications, but now also such that it could be used on the small port 3.0LX head. Today everything has been replaced by the lost foam version single piece manifold that does not use external end caps. This manifold uses the same casting p/n 860235 for all applications, but is machined differently therefore allowing it to be used on a variety of 3.0L engine applications. (Read More 860235A03 and 860235A04). By the late 1990′s the Mercury Marine Outboard division had been developing and producing various outboard components including Aluminum engine block castings using the Lost Foam (Evaporative Pattern Casting) for several years. Due to the advantages of being able to produce castings that yield very consistent wall thicknesses Mercruiser set out to apply this expertise towards their cast iron marine exhaust and cooling system components. 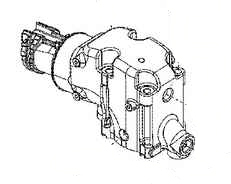 One of the 1st cast iron products produced by Lost Foam was the current 79550A 1 engine mount still being used today. Next in line to convert to Lost Foam was the thermostat housings which have changed significantly over the years. However, most all of the cast iron thermostat housings in production today are being produced as Lost Foam castings. From there this technology was then applied to a dual wall castings the first of which was the 44354 exhaust riser. 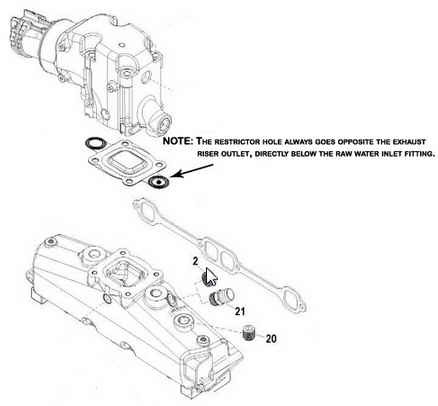 The exhaust riser is a dual wall casting because you have the outer wall of the casting with the water jacket area then being in between the exhaust wall of the casting. This riser has since been replaced by the 807988 castings but is still produced today as a Lost Foam produced casting today. This technology has continued through the years and is still being used today to produce most of the Mercruiser 3.0L, 4.3L, 5.0L, 5.7L, and 6.2L Exhaust Systems in current production. With the launch of the 496 CID 8.1L engines in 2001 things changed significantly with Mercruiser’s approach to their Marine Exhaust systems. 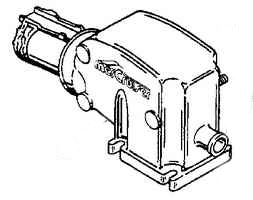 Up to this time Mercruiser had designed their exhaust systems using the standard sealing joint where both water and exhaust gas was passed through the same single sealing joint. However when the initial 496 engine design approach was “brain-stormed” with the field engineers from Mercruiser the point was presented that the top of this engine being the top of the line offering should come standard with the same type of marine exhaust system being offered by after market companies such as Stainless Marine (Read More). 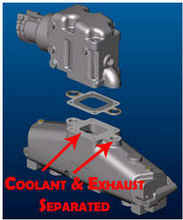 These after market product offerings utilized a design such that the coolant water is passed around the outside of the exhaust gas sealing joint. Therefore if either of the sealing joints developed a leak it would not allow water to get back into the engine. Due to the large success rate of this exhaust system design at preventing water ingestion related warranty claims Mercruiser then decided to apply this same approach to their 4.3L, 5.0L, 5.7L, and 6.2L marine engines (Read More). We are proud to note that the Dry Joint exhaust systems used on the 4.3L, 5.0L, 5.7L, and 6.2L engines utilized our designs that were awarded U.S. patents (Read More). Determine what specific engine model you have; 3.0L, 4.3L, 5.7L, etc. Do you want to purchase an individual manifold or complete kit w/ Manifolds, Risers, Gaskets, Bolts. Do you want OEM products? If so this will prevent purchasing as a kit or coated product. If you’re still unsure which direction makes the most sense you can check out our Technical Library for loads of good, related technical exhaust information.